The area that is Brentwood consists of three land purchases: that of Louis J. Bompart who acquired his lot first in 1804, that of the Gay family, and that of the Marshall family. In the 1870s a man by the name of Thomas Madden arrived and soon became the businessman of the community. He operated a rock quarry and constructed a tavern, a barbershop, a grocery store, and a blacksmith shop. Due to Madden’s prominence in the community, the town was then named Maddenville. With a location on the Manchester Trail, a route that was mostly frequented by mail coaches and prairie schooners going west, Maddenville in the 1800s became a prosperous little town on the outskirts of St. Louis, to which it was connected by a streetcar line. In 1919, it was discovered by the residents of Maddenville that the inhabitants of the neighboring Maplewood were planning to elect whether or not annex their town. To avoid annexation and to establish their own school district, the residents decided to incorporate Maddenville into a village. On December 15, 1919, the town of Maddenville officially became the village of Brentwood. During the late 1920s, the village earned an unhealthy reputation for its numerous gambling houses and illegal activities that took place around the intersection of Manchester Road and Brentwood Boulevard. The first mayor, James L. Willingham (in office from 1929–1931), ran on the promise to clean Brentwood up and eliminate the casinos, along with the hoodlums who hung around them, which he did. The town then became once again attractive for families. On April 12, 1929, Willingham signed ordinance 1A, which established Brentwood as a city and determined its boundaries. Brentwood’s school district operates two elementary schools, a middle school, and a high school. One of the elementary schools, Mark Twain, received the Missouri Gold Star and is a current Missouri School of Character. The high school is a multi-time recipient of the Blue Ribbon Award, a top award for schools in Missouri. Brentwood is also home to Brentwood High School, a 2006 and 2013 National Blue Ribbon Award winner, and Mark Twain Elementary School, a 2009 and 2010 National Blue Ribbon Award winner. “Excellence in education matters, and we should honor the schools that are leading the way to prepare students for success in college and careers”, said Secretary Duncan. “National Blue Ribbon schools represent examples of educational excellence, and their work reflects the belief that every child in America deserves a world-class education”. One of the main aspects of the character of Brentwood High School is its rivalry with neighboring school Maplewood-Richmond Heights dating back to 1919. Recently, Brentwood played Maplewood twice in the 2010 season, the latter being a win in the playoffs for Missouri division 2A football, where Brentwood eventually made it to the final at the Edward Jones Dome. Teachers try to take the rivalry into the classroom by prompting students to beat one another in the annual Missouri Achievement Program standardized test. 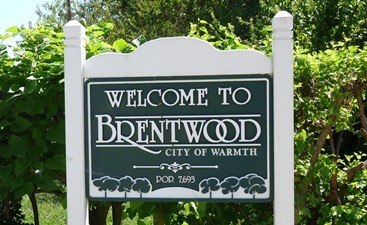 Brentwood is located at 38°37′9″N 90°20′55″W (38.619102, -90.348715). According to the United States Census Bureau, the city has a total area of 1.96 square miles (5.08 km2), all of it land.